For some, choosing the right wine to pair with their food is like choosing an outfit for a party. Should it be port wine, red wine, or champagne? It is an important task and requires focus and effort. Put your brand at the front of their options with custom wine labels. Our wine bottle labels are ideal as promotional materials, but can also serve as personalized gifts or souvenirs. When designing wine and champagne labels keep in mind that they serve as your sales representatives. They should represent you and your product in one cohesive design. Use quality colors and images that even the most hardened wine connoisseurs won't be able to ignore. Images and colors are not the only important elements when designing wine labels. Remember to include key details like the ingredients, alcohol level, manufacturer location and date. Knowing this information helps consumers make the right decision. Here's a useful post about wine label design that might help you with the design process. We print your labels using premium self-adhesive paper that is easy to stick on any type of bottle. We also have waterproof options available for printing. They are durable so you can rest assured that your promotional materials will last. 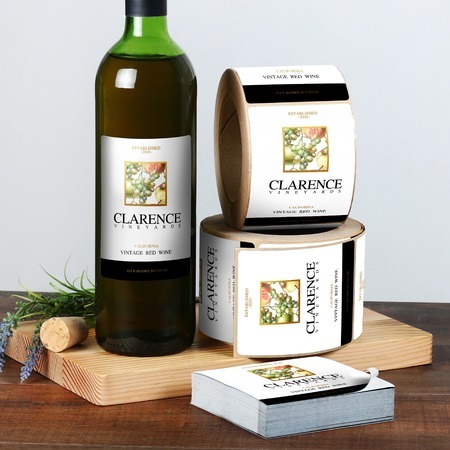 Our custom wine labels are available in cut-to-size or roll forms. Use cut-to-size for larger customizable sizes or roll for easier storage and machine application. You can personalize your wine labels even further with custom shapes. Printing turnaround time for cut-to-size labels is as fast as 1 business day, and 2 business days for roll labels.